WOW, branching out! I don't do S-scale, but that would be neat. Some higher quality offering sets for S-scale would please a bunch of folks I know. I hope this excites the S Scale guys. They need great models available. I love all of my GGD trains. Just hope they can keep their focus on the what he wants to do. wait …. what? Oh. Sorry. That sound like great news! I know the S scale guys would welcome such items. I'll try to contact the S Scale group and let them in on this. Do you have a ballpark price? If they're anything like what's in your O gauge line, they'd be great. Be aware, however, the quantity would be relatively small compared with O. There really haven't been any full length streamlined passenger cars made since the American Models (fairly basic) cars from the mid-1980's. Would these cars be on par with the O scale GGD cars, or as aluminum shells minus interiors? I know cost would depend on reservations, but is there a guesstimate as to cost? I personally would be interested in the Super Chief. I'll answer you here now, and later on the S facebook page. Feel free to quote me. Cars will be produced similar to our O Scale offerings, with interior, lighting, scale dimensions, underbody cluster. Tighter curves are no problem, but may require gaps between the cars to accomplish. HiRail and Scale Sets are a must. Price is no higher than our O Scale offerings. We don't have a quotation yet from the factory. OK, 1 vote for Super Chief, hahah. Super Chief, Broadway Limited. Cool. What Colombian? B&O or Milwaukee Road? Anything that ran out of Chicago is a winner for me. Scale length? Great. I have room for large radii. Come to think of it, we could offer (IN ADDITION TO THE SCALE SETS) abbreviated sets (shorties) for those AF guys that run really tight curves. Shorties not at the exclusion of the scale length cars, I hope. 20th century limited, Empire State express or how about a D&H Laurentian. I had to look at the calendar to confirm this was not April 1st! This should excite the S community! Scott, it might be worthwhile to see if there is a way to advertise at the upcoming S fest in the Chicagoland area. It is one of the biggest events in S. I would help cast a wide net I would think. While that iron is hot, how about some LIRR P-70 coaches in O gauge!!! I'd prefer Budd lightweight consists such as NYC Empire State Express, California Zephyr, Wabash Blue Bird but would go for smoothside sets such as PRR's Broadway Limited too. Will also second the motion for a consist of PRR/LIRR P-70 coaches - please add a B60 baggage car though if you will do P-70's! Will try to support these but it will depend on how many different sets come out and how close together they will be released so I can pay for them. If this becomes reality can I safely assume the first sets won't be out until winter 2019 or later? If that is the case I can plan for reserving a few sets. I assume if (yes, I know it's a BIG *IF*) these proposed sets get strong reservations there is a chance consideration will be made for producing the matching locomotives in S which would be E7, E8 and/or PA's? I imagine since you've already done these in O it cuts down on the research/design time at least. I would be interested in the Reading Crusader train. I have to check your webside for price and my affordability though. For years the S scale community has been wanting full length scale passenger cars, especially Budd cars. So I too am surprised at the seeming "ho-hum" from that side of S. I remember a while back, American Models offered to make full length Budd cars if 100 folks would commit to buying them. It didn't happen. Maybe those who wanted smooth sided full-length passenger cars have already made them via other means, like converting AM smooth sided coaches with different sides, or even bashing them into what folks want. We'll see. I would be interested primarily in anything PRR or NYC. Secondarily UP or New Haven. I can operate anything that will work on 30"R or larger, scale or high rail wheels. I do not care about the couplers except the lead car requires a high rail coupler to mate with my engines. For years the S scale community has been wanting full length scale passenger cars, especially Budd cars. So I too am surprised at the seeming "ho-hum" from that side of S.
Yeah, not even a raised eyebrow. You'd think there'd be some reaction by now at least. I remember a while back, American Models offered to make full length Budd cars if 100 folks would commit to buying them. It didn't happen. Close, I recall AM got 95 reservations for his proposed full length California Zephyr. Maybe those who wanted smooth sided full-length passenger cars have already made them via other means, like converting AM smooth sided coaches with different sides, or even bashing them into what folks want. We'll see. I am sure that these cars would be spectacular in detail, features, and price. The scale modelers should be accustomed to all three when investing in brass models, and it is surprising that they are not elated that a manufacturer has expressed interest in giving them what they have continued to demand and while they continue to rail against American Models, Lionel, and MTH for not doing the same. 3rd Rail has to determine where the interest lies in order to commit to manufacturing, and those interests are divided among prototypical scale or high-rail wheels and prototypical lengths or shorter versions to manage tighter curves common to high-rail. Those interests are further divided among all the desirable road names. You can divide a pie only so much before it becomes pudding. The news is thrilling to me, but the requirement of buying 6 to 8 cars at once is substantial. I suspect it will be the same for many others. Perhaps a more realistic approach is to offer a choice of coach, diner, and baggage rather than a full line-up baggage/mail/combine/diner/ dome/coach/ two sleepers/observation that would put the total cost over the top for many of us. Coach/diner/baggage or some such combination of full-length cars could "blend in" with the American Models cars many of us already have. Choosing road names is also a stumbling block for getting volume; but the existence of American Models' Pacifics, PAs, and E8s and others as Bob Bubeck mentioned is a clue as to what locomotives can head these new passenger cars and likely what road names of passenger cars the aluminum ones can complement. Cross-country through cars often meant "blended" road names such as New York Central with a Santa Fe sleeper. My fear is that too many different requests (full or short length, scale or high-rail wheels, road names) and too high a cost for a full 8-car set will be so restrictive that 3rd Rail will not find enough consensus to go ahead. If those of us in 1/64 scale could combine our pent-up buying power to fewer versions with the chief option of scale or high-rail wheels, 3rd Rail might be encouraged by the volume. It would also mean less risk for the manufacturer. My personal choice would be 3 cars of Santa Fe Super Chief/full-length/scale couplers/high-rail wheels; but I would be willing to go along with the crowd to get any 3 high detailed cars. I just hope we can get a "crowd" together! All this info is very good. Helps me formulate my plan of attack. Full sets not for everyone, so partial sets or separate cars should be offered to catch orders from both camps. I think I will start off by offering 3 major road trains, SF SuperChief 1937, NYC 20th Century Limited and PRR Broadway Limited. I will offer them in Full length 6 car sets, with add on cars, and 4 car shortie sets for AF customers. We can produce these as low as 50 sets each, but I would be thrilled if we could get 100 or more orders for each. They will not come at the same time, rather 3 - 6 months apart. Perhaps with this availability it will spur sales of engines by MTH or Lionel and the S Scale market could grow again. Perhaps. I also would be interested in a car set done for the Reading Crusader, scale wheels and couplers. Lightweights from the 1940’s  NYC Twentieth Century would be a great addition! Of course there are American Flyer PA units without the detailing of the other models and brass versions with more detailing than what American Models offers; but the point is that there were and are locomotives in our scale that can fairly accurately match up with your proposal. For those who are less concerned about historic accuracy, there are plenty of F3s, F7s, and FP7s in all three road names. Good luck! Scott, I just put in the order for a scale length, high rail, NYC set. Thank you for making this possible. 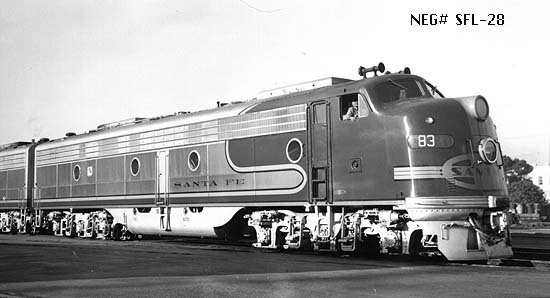 Technically, Santa Fe had E8m's, being rebuilt from the 1 Class EA boxcabs (into E8m B-units) and the 2 Class E1's (into E8m A and B units) in 1953. They weren't used on the Super Chief or El Capitan (where F-Units ruled,) but on secondary trains. I am very excited that we can do small quantities now. But that means it's a little more expensive with the tooling needed for each. Scott, Fantastic news....long overdue for SScale! NYC 20th Century Limited lightweights are a great choice. How soon and how to order? Just ordered the Scale full length 20th Century Limited. Thank you Scott!! Scott, Your order list doesn't show 8 car sets or the type of passenger car. I would guess the additional two cars will be offered later if these prove successful. Sorry, but $300 for one passenger car is tooooooo much for me. I'll pass. This is a very generous offer you have given the S model community. I would suggest that you place a copy of your offer in the S scale SIG (NMRA special interest group), as well as ads in the NASG Dispatch and S Gaugian magazines to reach as much of the S scale/hirail modeler community as possible. Please contact me if I can be further help in this matter.